My Dear and faithful fans. FFI is back! I am sorry that this site has not been updated in quite a while, but I am happy to say that it will be back and ready for adventure! Thanks a bunch! Welcome to FFI: Frasier Fans Inc. This site will feature weekly episode summarys and my reviews about it, plus emailed reviews from the fans! Episode Reviews | Cast Bios | News | Links | Site History | Mail! DON'T FORGET: The Frasier Fans Inc. Chat will be held every Thursday at 7:00 pm Central Time. Thanks to Frasier Fan Dan Kylochko. He has sent in his own review of the last episode of 'Frasier', Frasier's Edge. You can review it in the Episode Reviews section of this site. Thank you so much Frasier Fan. You really helped me out. See the new additions to FFI: the FFI Chat, What-you-think Poll, and the countdown to the episodes! Enjoy!!! When Frasier's 13-year-old son Freddy comes to visit, he cannot adjust to his maturing boy's indifferent attitude and new interest in girls. So he forces Martin and the lad to go camping with him in the great outdoors, in a vain attempt to reconnect with their old relationship. 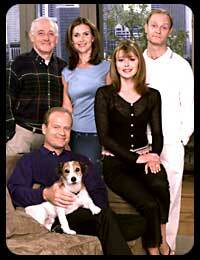 This site was created on the 8th of December 2000 for avid Frasier fans like myself. Thank you for visiting and be sure to sign the Guestbook below!